Hours of the Night, a collaboration between M.D. 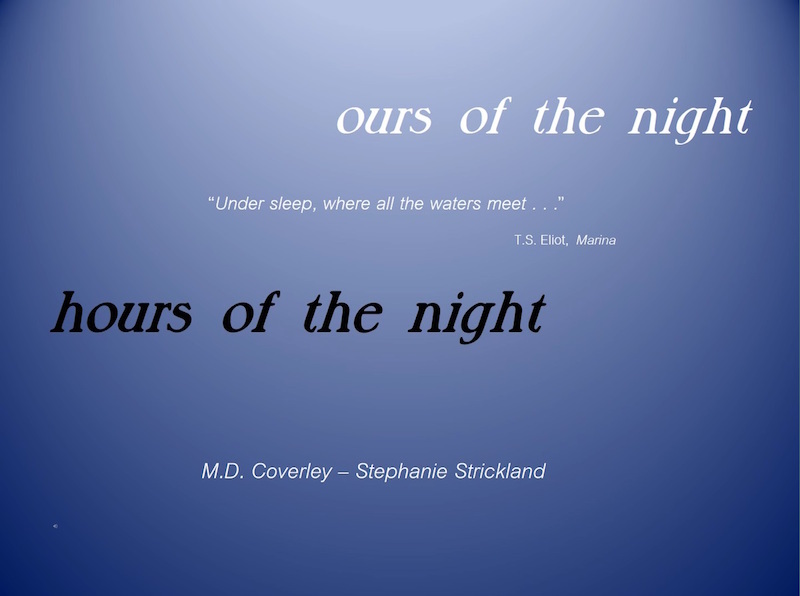 Coverley and Stephanie Strickland, the most recent of our joint explorations, is an experimental poem that takes up the delicate subjects of age and aging, sleep and the night. Hours of the Night has several sources. We had planned a work provisionally called Ana in 2001. At that time we found and manipulated the background tree image, the image of the boy, and many of the bell sounds. Other ideas took over in 2015. We often room together at conferences and are acutely aware of things becoming physically harder as we age and of interruptions to our sleep. Coincidentally Stephanie had read about the interrupted pattern of sleep as one that used to be common. Our piece came together slowly as we sought for aspects that reminded us of our childhoods (for Stephanie, foghorn sounds on Lake St. Clair) and of our present life as grandmothers and elder women. Between us we have 9 sons and grandsons; Stephanie also has a daughter and 2 granddaughters. Finding a picture of an older woman that would work for us was, as it turned out, the hardest task. Margie remembered the Eliot quote and Stephanie the Yeats epitaph. 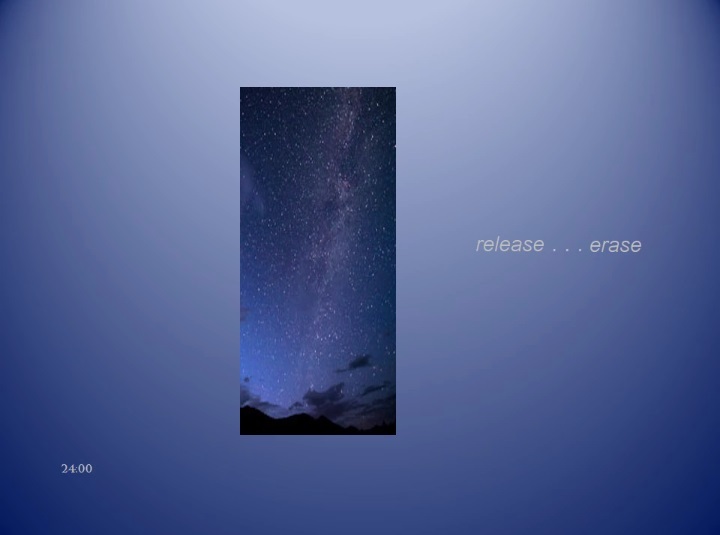 We worked very hard to find the right palette, the right (freely available) images, the sounds and their timing, all in service of a quiet, dark, still, nighttime meditation – the very opposite of usual Web fare. Since many tools we used in the past (Director, Flash, Anfy Java applets) are no longer supported or have limited reach, we wanted to make use of a widely available and easily managed platform. Though neither of us had used it in the past, we believed PowerPoint to be a popular, standard authoring system that produced work readable on any desktop, tablet, or phone. Not so, as it turns out; thus, our multitude of forms. The MP4 version will work on any computer that plays video. The PowerPoint plays on Windows machines with proper fonts installed and a recent version of the program. Its standalone form is subtly different from the slideshow, permitting a reader-chosen reading pace. Though the video is Hours’ most portable form, the aesthetics of the piece are not those of a bit of a film but of a series of slides. Both of us began as writers in print. Margie experimented with computation and code as early as the 1980s, since the schools she taught in had computer labs of some kind. Stephanie worked in a college library in the ’80s and ’90s and spearheaded an automation effort. Both applied to become NEH Fellows in Professor N. Katherine Hayles’s 1995 UCLA seminar, “Literature in Transition: Implications of Electronic Textuality.” These seminars are mainly for academics, which Margie was, but Stephanie came as an independent scholar, a representative of a public literary center she had helped found and as the only poet. She learned of the seminar at a Society for Literature and Science meeting – Hayles had helped found SLS [now SLSA]. We both jumped at the chance to implement visions exceeding print, Margie’s Califia and Stephanie’s True North Hypertext, and we became fast friends over the course of that summer. Jointly and individually, we have pressed every affordance of the media in which we worked, as many as we could integrate within our aesthetic goals. 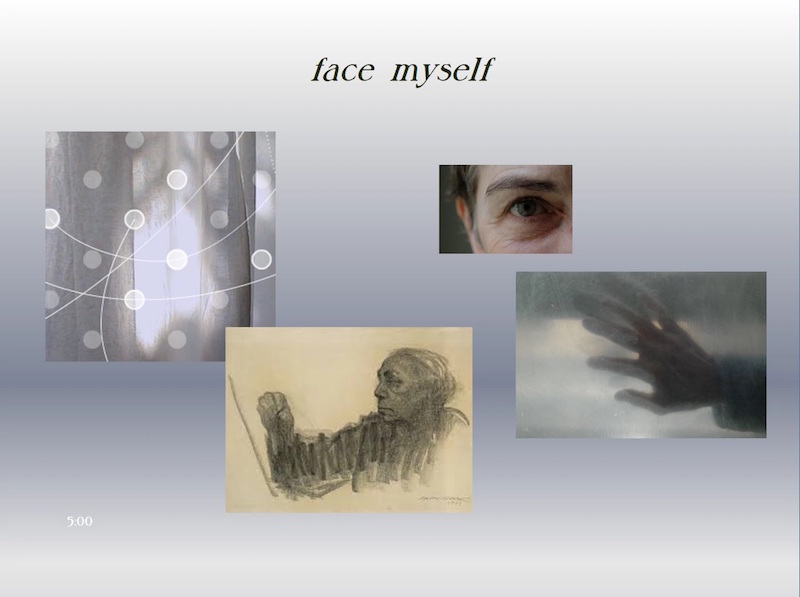 In Stephanie’s case [http://stephaniestrickland.com], the digital work impacted subsequent print work and vice-versa. Several of her pieces have multiple components, some digital, some not. Margie [http://califia.us] has reworked several of her pieces as technology obsolesced earlier software. And she has, for instance, made database documentary essays using Excel, to tell the story of Fukushima among others. 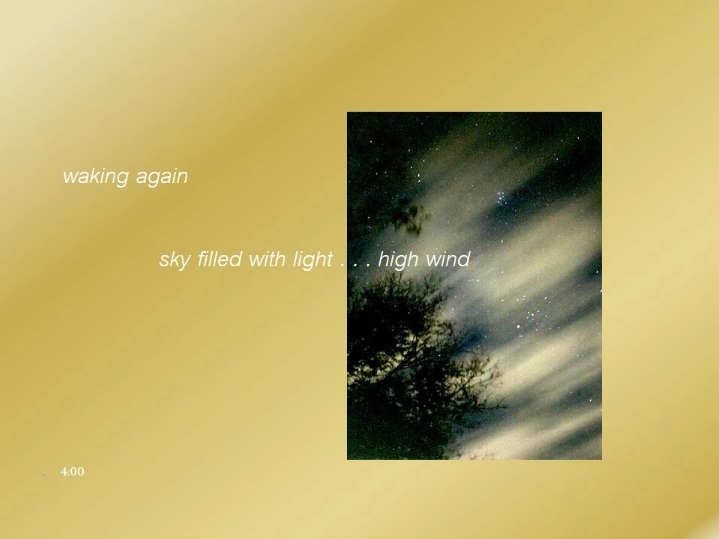 Marjorie Coverley Luesebrink writes hypermedia fiction as M.D. Coverley. Her full-length interactive, electronic novel, Califia, is available on CD-ROM from Eastgate Systems. Egypt: The Book of Going Forth by Day was published in 2006. Coverley's Web short stories and essays have appeared in many zines including The Iowa Review Web, BeeHive, and frAme. She is a member of the Board of Directors of the Electronic Literature Organization and was given the Marjorie C. Luesebrink Career Achievement Award in 2016. More at http://califia.us. Stephanie Strickland has published eight books of poetry and 11 works of electronic literature. Zone : Zero, book + CD, includes the poem slippingglimpse, which maps text to Atlantic wave patterns. V : WaveTercets / Losing L’una is accompanied by the Vniverse app for iPad, written with Ian Hatcher. A 3-part poem generator, written with Nick Montfort, pairs Sea and Spar Between with Duels—Duets, a poem that reflects on Sea and Spar’s composition, and with cut to fit the toolspun course, a glossed code version. Recent digital poems include House of Trust with Ian Hatcher and Hours of the Night with M.D. Coverley. A member of the Board of Directors of the Electronic Literature Organization, Strickland edited the Electronic Literature Collection Volume 1. For more on her work, go to http://stephaniestrickland.com.